Description: SD40-2 'pumpkin' leads Amtrak #14 (sb. Coast Starlight) as it swooshes out of the station. Description: Coast Starlight #11 at Albany station at 19:45. Description: Coast Starlight #11 departing Albany station at 19:50. Description: AMTK 132 leads a northbound Springfield Line shuttle past northbound Guilford train PLED. Description: AMTK 112 leads a northbound shuttle past northbound Pan Am train PLED, just after stopping at the Berlin station. Description: Seen here pulling a southbound Amtrak Coast Starlight. Description: Northbound Coast Starlight #14 arrives at Albany station at 14:24. Description: Coast Starlight #11 departs Albany station. 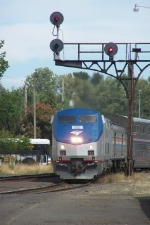 Description: Southbound Coast Starlight arriving in Salem. Description: Crossing Hines Street at the north end of the yard. Description: Amtrak#14 passes under the former SP cantilever and stops at the Eugene depot. 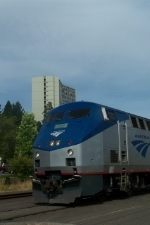 Description: Amtrak#14 is stopped at the Eugene depot, while senior citizens rest in the tallest building in Eugene. Description: Due to flooding in central Wisconsin, Amtrak was forced to detour over the BNSF for a few days in June 2008. Here is westbound #7 passing through Prairie du Chien on day 2 of the detours. Description: A very rare daylight appearance of the westbound Empire Builder. They've been running late due to the massive floods between Minneapolis and Chicago. Description: The days Coast Starlight detour over Tehachapi and through the central valley. Description: For a crew change before continuing onward to Sacramento. Description: On #14, Fresno C.A. Title: AMTK 112 rounding the loop at South Walong getting ready to meet 11 at Woodford.